The food and beverage industries prefer to use stainless steel vats because the steel is chemically neutral and will not add flavors or impurities. It is also very easy to clean and keep sanitary. Stainless steel conducts heat well, allowing for precise management of the substance inside, and it can be refrigerated to maintain lower temperatures. Caustic liquids will not easily damage the vat, though lower grades of stainless steel can be incompatible with certain wines and ciders. Vats are typically constructed from food grade 304 stainless steel which is also called 18/8 or 18/10 because of the ratios of chromium and nickel. Stainless steel is produced when steel and alloys are melted together. Once homogeneous, the molten metal is hardened through the annealing process.For a vat, the cooled steel is fed through a series of rollers that gradually bend it into a rounded shape. The curved sheets of stainless steel are then cut, finished and welded together for a seamless watertight result. The majority of stainless steels vats are designed to keep the contents hot or cold. High density polyurethane or a similar material can be wrapped around the vat then covered with aluminum or another sheet of stainless steel to keep the contents of the stainless steel tank warm and insulated. For refrigeration, typically a cooling jacket will be used. Similar in technique to insulation, a jacket is fastened on the outside of the vat and circulates a cooling agent like glycol, ammonia or water around the container for temperature control. An alternative to a jacket is a double-walled vat where the coolant runs between the two walls. Another integral feature is the manways, which are openings used as access doors, sampling ports or fill openings. 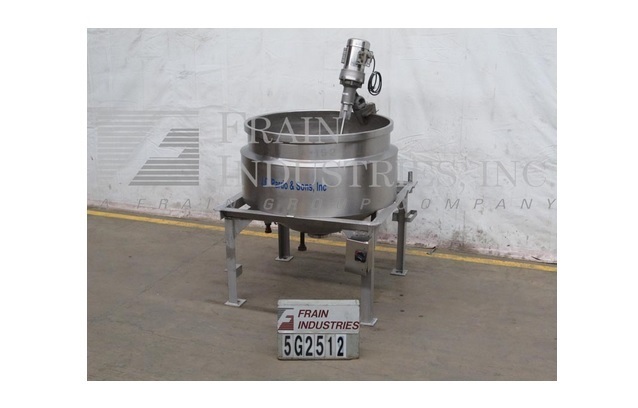 Agitators are also commonplace, especially when the vat is used for food processes like mixing or separating liquids. Some stainless steel vats have lids that can easily be lifted or removed while others are self-enclosed tanks with an atmospheric vent feature to release the pressure inside. Because of the weight and potential pressure building inside vats, especially those used for fermentation, vats should be placed on an adequate foundation like concrete or asphalt. Vats typically do not require a separate stand but are sturdy enough to stand on their own. Stainless Steel Vats There are three main types of stainless steel vats: horizon, or enclosed, open top and SVC, or cottage cheese vats. Whether oriented vertically or horizontally, vats are typically cylindrical to resist hydraulic pressure.